can be	used on walls and the ceilings as decorative sound absorbers. 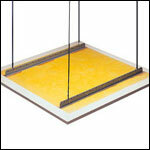 Hang from the ceiling and float over areas in need of sound absorption. The cables allow for mounting at different angles and heights throughout the room. 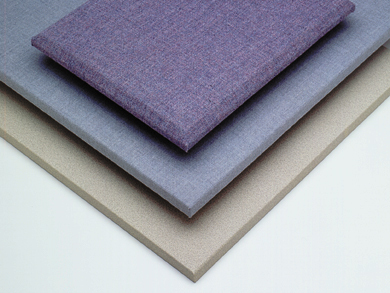 Fabric Covered Acoustic Panels come in these thickness: 1" and 2"
Cost a little extra to have: Beveled, or Rounded Edges. Custom made for your needs. **Box Sets (2'x2' and 2'x4') can be shipped via UPS or FedEx Ground as Oversized Boxes. **Panels larger than 2'x4' will have to be shipped via "Freight Truck." General Pricing, Straight Edge - by Each. We can also custom manufacture these panels with SoundBlocker1 to help block sound too. Fabric covered panels come in a wide array of colors. Here's two. A. Impelling clips (best choice for most applications on walls). B. Using Screw Caps, and screwing the panels into place and the screw cap covers the screw making the panel have an upholstery type look. Copyright 2017 © GK Soundbooth, Inc.